This time of year is bittersweet for me. Summer is winding down, the kids are back to school (my house is painfully quiet) and the days are slowly getting shorter. But you know what? That isn’t going to stop me from savoring summer for one last long weekend! Labor day is coming up and I plan to savor every last glorious drop of summertime by firing up the grill and enjoying some scrumptious food with friends and family! AND I’ve got a fun giveaway to make your Labor Day even more wonderful thanks to the kind folks at Bush’s Beans! But first I’ve got a mouthwatering recipe that you can put together in minutes! Tangy Orange-Glazed Chicken breasts that will tickle your tastebuds! 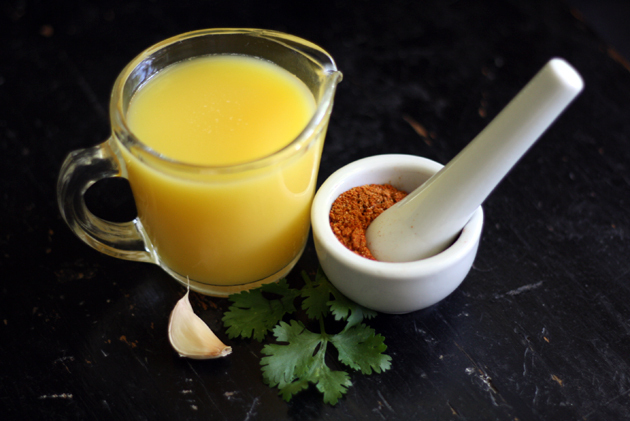 Orange juice, garlic, fresh cilantro and a mix of cumin, coriander and paprika. 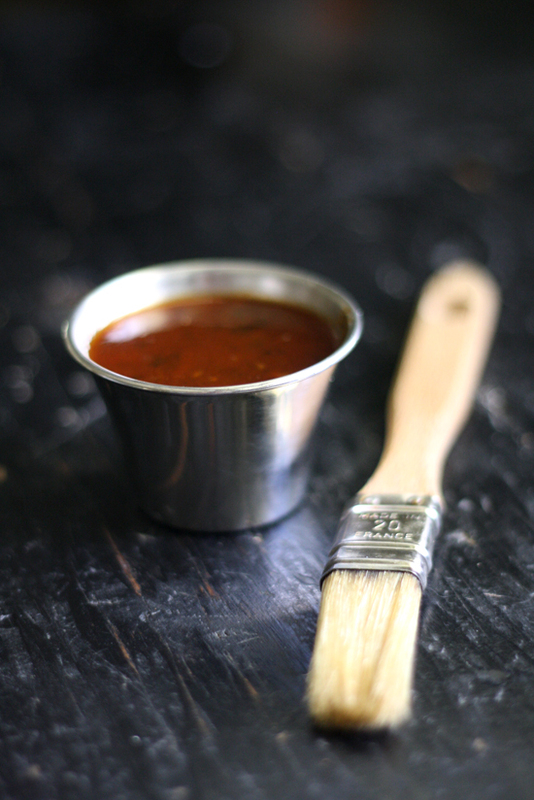 The glaze also includes ketchup, brown sugar and hot sauce (not pictured) for an added sweet & spicy kick. This glaze smells as glorious as it tastes. It’s like no other glaze I’ve ever tasted. The hot sauce, brown sugar & ketchup give a deep rich & spicy flavor, while the orange juice & cilantro add a tangy fresh punch and the spices give it a warm finish that just lingers on your palate. My Yanni developed this recipe and I would like to state for the record it’s #3,256 why I love him so. 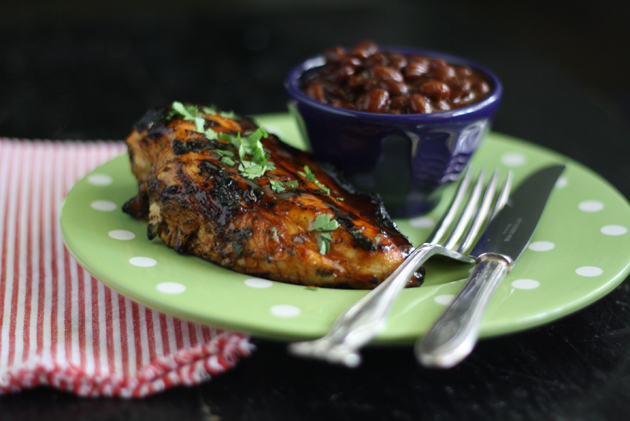 We paired the Tangy Orange-Glazed chicken with Bush’s® Sweet Mesquite Grillin’ Beans. I recommend that you do the same. The black beans simmered with pieces of red peppers & onions in a sweet & smoky sauce complimented the chicken in the most beautiful way. Here’s wishing you and yours a most wonderful Labor Day weekend filled with fun and glorious food! Congratulations Cellabella! I’ll be contacting you about your prize details! 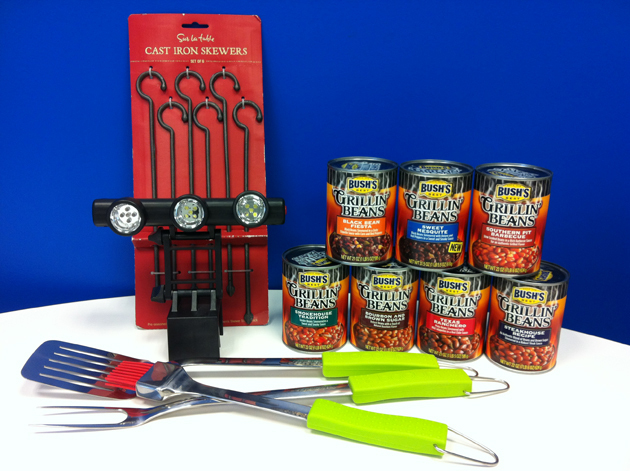 Now it’s time for the fun giveaway from Bush’s Beans! Wait till you see the great grilling package these wonderful folks put togther for you! Next time I make Sweet & Spicy Steak Kabobs I need to have some of these gorgeous cast iron skewers from Sur la Table on hand! Please submit the name of a grilled chicken, steak or chops recipe and favorite flavor of BUSH’S Grillin’ Beans you’d serve with recipe along with a one sentence description of recipe or one sentence why you chose it (e.g., it is a recipe I’ve served at family cookouts for 10 years) The giveaway begins today Monday, August 27, 2012 and will end on Friday, August 31, 2012 at 6:00 p.m. EST and is open to all U.S. residents. One winner will be randomly selected and announced sometime Friday after 6:00 p.m. EST. Please make sure to leave a valid email address so that we can notify you about prize details! First prepare the glaze. Finely dice garlic clove, then mix 1 tsp course salt pressing carefully with the knife until the constancy of a paste. Mix all other ingredients in a sauce pan. Let simmer on a low heat stirring frequently until reduced by about 1/2 (about 20-30 min). As the glaze is reducing, season chicken with Cumin, Coriander ,Paprika, chopped Cilantro, Lime juice, hot sauce, and S+P to taste. Place on grill on high heat to quickly sear both sides, then turn again, this time glaze chicken at each flip. Cook until internal 165° F (about 20 min depending on heat settings). When done, baste chicken with glaze one last time then let it rest for 5 min. Serve with additional side of glaze and Bush’s Sweet Mesquite Gillin’ Beans. 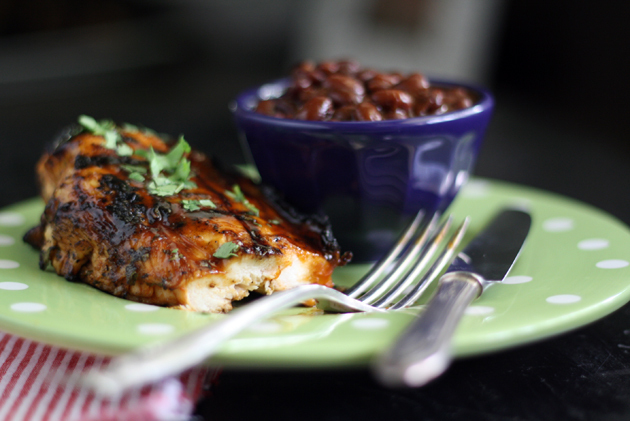 My Mom’s Cilantro Honey glazed chicken would go well with the Fiest beans! Wendy! I could climb right through my screen after that chicken. Such a gorgeous recipe and even more gorgeous photos! I can’t wait to try it! Oh wow, Spicy Peach Chicken Wings with Fiesta Beans…mouthwatering!! A pretty simple company lunch is to buy tenderized chicken breasts. Marinate in your favorite Italian salad dressing. Grill and serve with sandwich fixings. Our household favorite is mesquite chicken. We use a mesquite marinade and add fresh lime and garlic. It would taste great with the Sweet Mesquite beans! I think that Yanni hit the mark on this one. The flavors sounds fantastic! I’m trying to grill every single night before our warm weather fades to cooler nights. This will definitely be one to try. And the Sweet Mesquite beans? Love them! YUM! 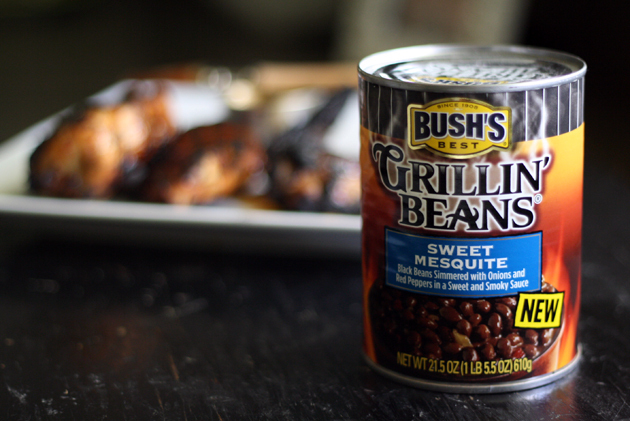 Grilled Chicken Fajitas would go great with Bush’s Fiesta Beans. I’m salivating now. My mom’s honey glazed chicken recipe would pair up with Bush’s Sweet Mesquite perfectly. I would make this for our family monthly picnic. Southern Pit Barbeque beans with my apple juice-honey marinated BBQ baby back ribs cause I’m from the south. Oh by the way, it looks like Cousin Isaac is coming to pay us a visit, so grilling may be the only way I’ll be cooking for a while. I’d make a my signature Rosemary Garlic Flank Steak recipe served with Bush’s Bourbon and Brown Sugar Baked Beans. My flank steak has been my go-to party dish because I marinate it a day before with olive oil, soy sauce, sugar, garlic, rosemary and onion. After a quick grill or broil, the steak is done with the cooked marinade as a sauce. 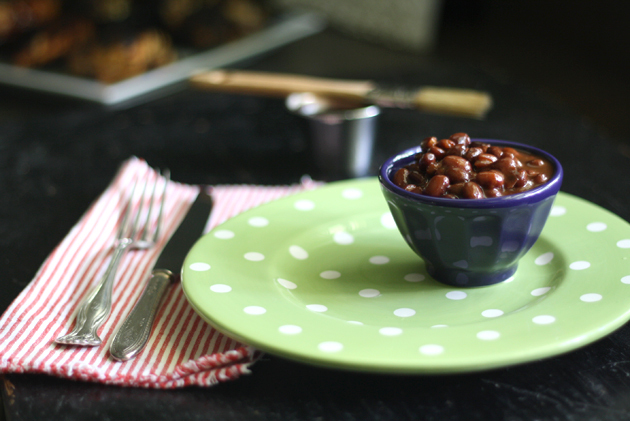 The sweet baked beans complement the saltiness of the steak perfectly! I know my hubby would love a Texas beef brisket with a Bush’s BBQ beans. I like, carne asada that has been marinated at home overnight, with some “Black Bean Fiesta”. This is so simple and tasty that after my hour long commute home I am willing to cook this. A great recipe to serve with Bush’s Black Bean Fiesta is Rosemary Mustard Pork with Peaches. This grilled pork recipe has a great Rosemary Mustard sauce that compliments the pork and the beans perfectly. Great for lunch dinner or any occasion. I love orange glazes and I’m keeping this one to try soon! Oh, YUM! I love orange glazed chicken – this looks like such a beautiful recipe! A favorite grilling menu at our house includes ribeyes, medium rare, with grilled corn on the cob and Bush’s Steakhouse Recipe beans — the perfect summer meal!